We have emailed our January 2014 edition of the Minerals.net online newsletter. Please click the image below for the larger version. We also added a special gemstone page for Andalusite. Announcing the Minerals.net 2014 Giveaway! We are doing a new promotion to win a free trip to next year's Tucson show - all expenses paid by Minerals.net. Stay tuned to view our ads! 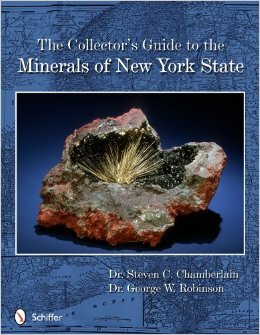 I recently ordered a copy of the new book by Dr. Steven C. Chamberlain and Dr. George W. Robinson titled "The Collector's Guide to the Minerals of New York State." The book was published this past year, and definitely filled an important void. New York State has a rich mineral history with many classic localities. This book focuses on many of those important New York mines and deposits. What I liked about the book is its thorough coverage of the localities discussed, including a listing of the most important minerals found there as well as the current status. I also liked the way the book divided the localities by the geology type of the rock (i.e. occurrences in sedimentary rocks, crystalline rocks, and fractures as the main sections). The information is well-researched, with the authors having extensive field experience in localities in the state, combined with a wealth of knowledge on mineralogy and geology. The pictures in the book were excellent and well-represented. The specimen selection and photo were well-thought out and professionally done. However, several pictures did have artificial background with hard edges that could have had a better graphic job done to them. After contacting Steve Chamberlain, one of the authors of this book, he mentioned to me that they were constrained by the publisher by limiting the book to 96 pages. This limited the number of localities they initially had in mind to include, and therefore, they could not properly focus on all localities within the state. However, they have a promise from the publisher to do a full mineralogy of New York State that would include "everything and the kitchen sink." This is quite an ambitious goal that may be too big to complete, but let’s hope they can pull through with this massive feat!